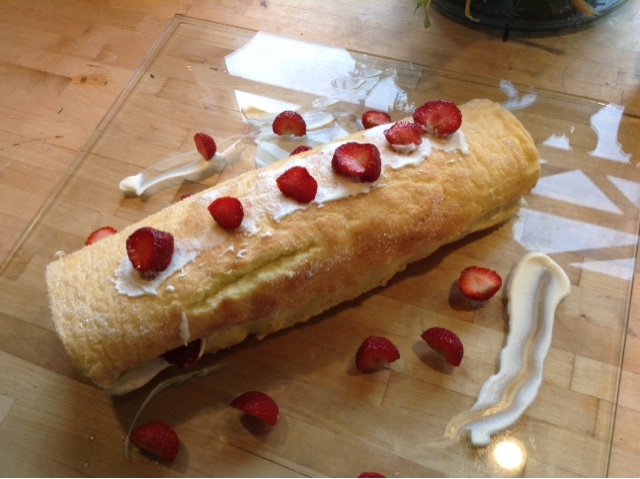 Hi, so today I made a strawberry swiss roll and I thought I'd share the recipe with you! 1. Whip the eggs and sugar into a stiff foam. 2. Measure the flour, potato flour and baking powder into a bowl and mix them well. 3. Add the flours into the egg- and sugar-mixture with a sieve. 4. Bake the swiss roll in the oven in 220 C about 5-8 minutes. 5. Sprinkle some sugaron a sheet of baking paper and flip the roll on it. 6. Whip the cream and spread it on the roll. 7. Chop the strawberries into smaller pieces and putthem on. 8. Roll the roll and voilà! You are done!